as a lifelong chicagoan ... it may come as a surprise that i've only eaten at one rick bayless restaurant ... & it was with the babe. (take a look here to see how bananas that lunch was.) that is, until now. after months of attempting to get a reservation at leña brava in the west loop, the impossible became possible & off i went with a couple girlfranz. besides knowing that leña brava was bound to be delicious, i didn't know what to expect. especially because their website leaves you (well, me) wondering ... "fire & ice have never played so well together. leña brava -- "ferocious wood" -- takes its inspiration from the multicultural elements of baja california norte, the region's celebration of live-fire cooking & the area's world-class wines." this might as well been written in pig latin. spanish i would have understood. slices of michoacán avocados, ginger-infused jicama, habanero chile, grapefruit, lime agria drizzle & black pepper. not pictured : crunchy corn tortilla crisps. dinner started off strong ... this + the incredible spicy margarita i enjoyed (which i have been wanting to replicate since & have not) = feeling this meal from the get-go. i love jicama, i love grapefruit & i love avocado. so this was just pretty much perfection. 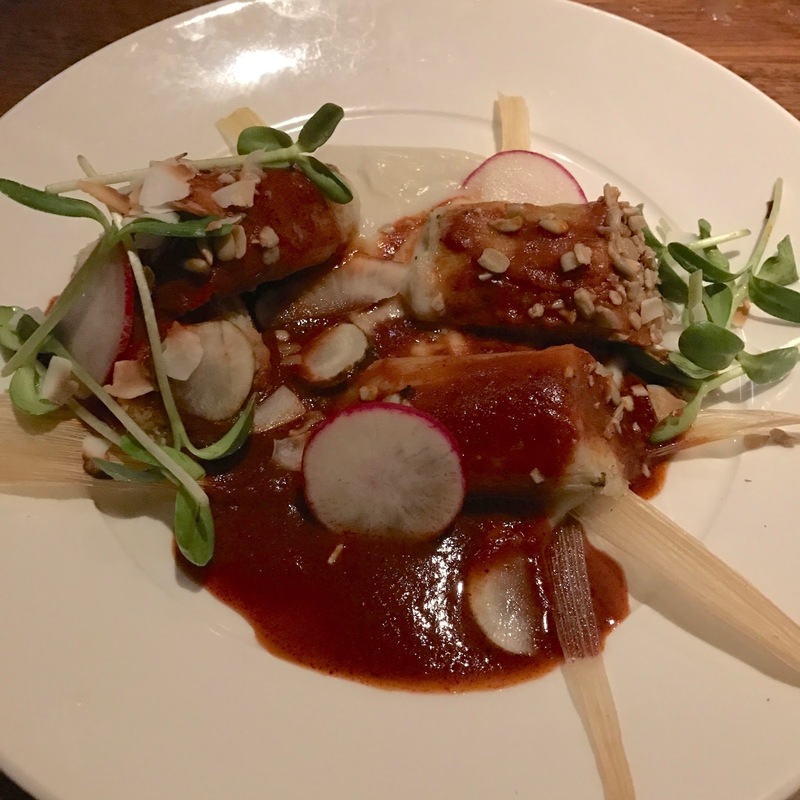 fresh-ground heirloom corn tamal infused with sunchoke & coconut, red pipián (cascabel chiles, sunflower seeds, spices), radish & toasted coconut. as i've said before, i grew up eating chicago-style (non-vegan) hotdog stand supreme tamales ... this is far far far from that, but still. tamales hold a special place in my heart. these were probably the highest-end tamales i've ever eaten ... aaaand they were awesome. my lifetime membership of the clean plate club certainly did not expire on this night. plus, this was a ready-made vegan dish already on the menu. #winning. basically, leña brava ... super tasty ... fancy, but not intimidating ... margs on point ... just generally legit. if you can get yourself a reservation in the next century, i highly recommend you take it.